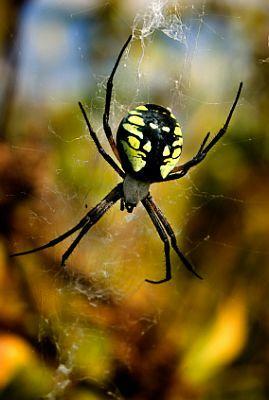 The yellow garden spider, or Argiope aurantia, is one of the most common spiders you will see in your yard and garden. These brightly-colored spiders spin large, conspicuous webs, making them among the easiest spiders to identify. While their appearance may be alarming to the arachnophobes of the world, they are, like most spiders, essentially harmless to humans. You can easily recognize Argiope by its striking coloration, large size, and impressive web. A bold, contrasting pattern of black, yellow and occasionally white mark the abdomen and legs of the spider, presumably to advertise to birds and other predators that it will not make a tasty meal. The female is generally much larger than the male, in some cases reaching over one inch (28 mm) in length. The male, though similarly patterned, can be as little as one quarter the size of the female, and tends to build smaller webs. Mature males may forgo web-building altogether to search out a suitable female and share her web during mating. Although the spider itself is large, beautiful and impressive, the unique web is often its most noticeable feature. Reaching a diameter of up to two feet (60 cm) with a distinctive zigzag pattern across the middle, Argiope's web is truly a marvel. The zigzag portion of the web, thought to be an adaptation to prevent larger creatures form unintentionally destroying all the spider's hard work, is made of noncapture silk and is not sticky. The spider typically rests, head-down, on this portion of the web, waiting for prey. Impressively, the female eats her own web each day and constructs a new one, according to the University of Arkansas Arthropod Museum, to keep the structure in prime condition without wasting resources. Argiope occurs throughout most of the United States, but is most common along the coastal regions. You are most likely to encounter the spider along the eastern half of the North America, reaching from Ontario and the Atlantic provinces in Canada, through the eastern United States and as far south as Guatemala. It is uncommon in the center of the continent, and in the west is restricted to restricted to California and Oregon. Your garden is perhaps the ideal habitat for this spider, as it prefers to build its home in sunny, sheltered areas between bits of tall vegetation or in the eaves of houses and sheds. With such conspicuous coloration, Argiope certainly gives the impression of an insect not to be trifled with. If you have encountered this species in your garden, you are most likely wondering if you need to worry about being bitten, and if so, whether the bites are venomous. In truth, most spiders will bite if provoked, and nearly all carry a certain amount of venom, according to the Washington University Burke Museum of Natural History and Culture. However, the venom exists to subdue prey, and since humans are not normally a prey species for spiders, very few carry venom sufficient to harm a human. The female Argiope is known to bite if she feels threatened, especially if she happens to be guarding an egg sac. However, if left unmolested, most yellow garden spiders are unconcerned with humans. Even if you happen to accidentally elicit a bite, you can expect a brief stinging sensation and perhaps a raised, red bump, but no further harm. The garden is a place where nature meets civilization. In most cases, these two opposing forces can coexist peacefully. Many garden creatures, including spiders, bugs and even snakes, are not pests, but allies. Learning to live with the various natural inhabitants of your garden and seeing them as the beneficial additions they are only adds to the peace and tranquility of your green space.